Question: What would be the climate after 30 years? Would temperatures (and ice-sheets) rise, fall, or be redistributed somehow? What would trade winds and ocean currents be like: are there areas where the surviving landmasses are significant enough to generate gyres? I imagine storms will become more powerful, but when and where will they be concentrated? I'm specifically interested in the area around the west of the main Tibetan landmass and the islands which used to be Iran. There is some potentially helpful info here, though it addresses fully ocean planets and the results are inconclusive. I'm a humanities student, please try to avoid jargon if possible. I do not have set ideas about the average temperature or salinity of the new water, so please feel free to either assume that this is the same as that already present on Earth (average 5 degrees centigrade). Don't worry about how the water arrives on Earth; this takes place through a non-scientific process. Simply assume that it happened, and 30 years later, what are the consequences? Your proposed planet would essentially be a water planet, despite the small amounts of land still found on the surface. As such, we can make a few simplifying assumptions and work with some best-guess scenarios. The equator is still going to be the warmest area, as it's receiving the most solar radiation per square meter. Most of the evaporation will happen here, and the ITCZ will remain intact but will actually align nearly-perfectly with the equator, rather than being deflected to the north as it is in today's Earth. The atmospheric cells will radiate from there, following idealized Hadley and Ferrel models. As pointed out by the Reddit link you found, the jet streams will grow a bit stronger because they no longer need to meander quite as much. You can check out what the jet stream is doing today at this cool website. They'll still run into the Himalayan Plateau and the Andes, but those will each be easier to avoid. The winds across the planet will probably get stronger, leading to more powerful storms and more destruction when they do run into the remaining land. There's an article here that argues it won't be that large of a change, but this has been disputed by other papers. The monsoon season would be largely minimized. Monsoons are caused by the movement of the ITCZ, which would be significantly weakened for the same reasons described above. Without a strong ITCZ, the monsoons will likely be insignificant. The oceanic currents are a bit more complex and we don't have as clear of an idea what will happen with them. Some papers find that the Earth becomes latitudinally stratified, with ice caps reaching down much further and the equator becoming warmer. Other papers find that the ocean takes over where the atmosphere fails and succeeds at transporting huge amounts of heat between the equator and the poles, leading to less a less-stratified planet that's more homogeneous temperature-wise. 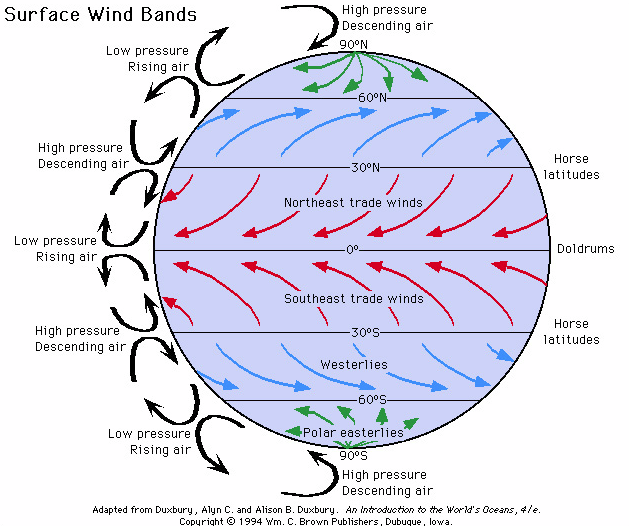 The gyres themselves would largely dissipate - there's no continental mass to deflect them, so the currents would continue in their normal direction and would wrap around the planet. I'm not certain on this one, but it also seems likely that the increased ocean surface area will dramatically increase the amount of water in the atmosphere. Because water is a significant greenhouse gas, this will cause an increase in longwave radiation absorption and an increase in the global temperature. This could lead to a runaway greenhouse effect like L. Dutch points out in his answer. Finally, the albedo of the ocean is much less than the albedo of land. This means that less incoming radiation would be reflected and more would be absorbed. Extrapolating from this site, the Earth's energy budget would increase by about 25 watts per square meter, or maybe 3% of the current amount. This would also contribute to a warmer planet and more greenhouse-like effects. I don't think the other answers so far have discussed the effect on the water cycle in great enough length, so here goes. There will be no problem with lack of rain. Even areas that were previously snowy mountaintops will now have a tropical climate. As other answers have pointed out, the water vapor will significantly increase temperature, which means a ton of water going into the atmosphere as water vapor, which will cause a ton of rain. I suspect that humans will be able to deal with the rain and humidity, but the temperature poses a threat to humans if it becomes a positive feedback cycle with the water vapor. In this scenario, I am imagining that the water entering the ocean is salt or brackish water, or that its salt concentration is not low enough to make the oceans drinkable. The major problem in this scenario is getting fresh water. The areas on the map that are above water have small land areas and are stretched out. That means there won't be many freshwater lakes or streams. Most of the aquifers are under water too, and there aren't many (if any) aquifers on mountains. This seriously affects the feasibility of humans being able to live with such high water levels. If humans have the resources, though, they will build rain-catching devices to provide their water. Without fresh water, humans will quickly perish of dehydration. As hinted by AlexP in their comment, any object of extraterrestrial origin brings along a lot of kinetic energy. This would result in the added water to boil off, resulting in the atmosphere being saturated with water vapor. Water vapor is a greenhouse gas way more effective than CO2 at blocking IR radiation, therefore the immediate result would be turning the planet into a sauna. At that point it's very likely there would be a second hell-like planet a la Venus orbiting the Sun. Not the answer you're looking for? Browse other questions tagged climate temperature ocean climate-change currents or ask your own question. How would a larger axial tilt affect the Earth's climate? Could the city of Boston, Mass avoid rising sea levels by building levees? What will be the first and the last piece of land to drown because of climate change?